He continued, "I went down there on a visit and they have great team chemistry and the coaching staff is great. I felt like it was the right fit." Zags Blog: Paul Jorgensen, a 6-foot-2, 180-pound point from Don Bosco Prep in North Jersey, verbally committed to George Washington Thursday night. “I chose to commit to GW over Fairfield, Harvard, Lehigh and Quinnipiac because I loved the city of DC,” Jorgensen told SNY.tv. New Heights coach Chris Alesi said Jorgensen can help coach Mike Lonergan’s club. “Paul is a true point guard with an innate ability to break defenses down off the dribble,” he said. “He lives in the lane. Paul also has an reliable stroke which can allow him to play off the ball some. NBC Sports: With mainstay Juvonte Reddic and Florida State transfer Terrance Shannon both entering their senior seasons, VCU head coach Shaka Smart needed some additional bodies in the front court for the 2014 season and beyond. On Friday the Rams received a boost in that department, as 2014 forward Justin Tillman (Pershing HS, Detroit) verbally committed to attend the Atlantic 10 school. Tillman helped lead the Doughboys to a 25-1 record and a spot in the Michigan Class A state quarterfinals this past season, where they fell to eventual champion Romulus High School by two points. Two of the players on that Romulus team, Wes Clark (Missouri) and E.C. Matthews (Rhode Island), are expected to be key contributors on their respective college teams this season. NERR: Cushing Academy senior swingman Idris Taqqee made a verbal commitment to St. Bonaventure on Sunday afternoon. Taqqee was coming off a successful grassroots and EYBL season with Expressions Elite, emerging as a critical part of their rotation thanks to his versatility. One thing that Taqqee does as well as almost anyone in New England is defend the perimeter. With long arms and good instincts, he’s capable of checking any of the three perimeter positions, and also a good perimeter rebounder. While his individual offense, and specifically his shooting range, had improved in recent months, he differentiated himself from other swingmen with the maturity and unselfishness to accept a complimentary role on the offensive end, but proving himself invaluable defensively. CSN Washington: Upon arriving on the George Washington campus, coach Mike Lonergan stated the Colonials would aggressively mine the D.C. area for recruits. He continues to be a man of his word. Saint John's College High School product Darian Bryant confirmed with CSNwashington that he would be part of the Colonials' 2014 class. The 6-foot-4 wing broke the good news to Lonergan, deciding to join the Atlantic 10 program over runner-up Delaware. 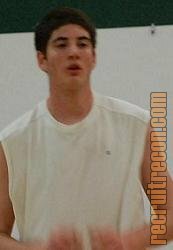 Gazette Net: The University of Massachusetts entered this summer hoping to add at least one big man to the program. The mission appears to have been accomplished as Rashaan Holloway, a 6-foot-9, 285-pound big man from Elmer, N.J., committed after making an unofficial visit to Amherst earlier this month. Holloway chose UMass over offers from Seton Hall, La Salle, Temple and Drexel. Minnesota was also showing interest. He joins a freshman class that includes Donte Clark, a guard from North Carolina who is sitting out this season as a nonqualifier. UMass has one scholarship remaining for the 2014 recruiting class. Richmond Times-Dispatch: Something recently happened to the University of Richmond basketball program that hasn’t happened in a while. The Spiders lost a player with eligibility remaining. Luke Piotrowski, who’s 6-foot-11 and spent one of his two years at Richmond as a redshirt, is transferring. The Spiders haven’t been bitten by the attrition bug much since early in Chris Mooney’s coaching tenure, which started in 2005. The Spiders picked up an oral commitment from 6-6 Chandler Diekvoss, from De Pere, Wisc. He averaged 16 points and 6 rebounds last season as a junior, and shot 44 percent from 3-point distance, at West De Pere High School. Zags Blog: St. Joe’s picked up a tough, gritty New York point guard Friday when Shavar Newkirk of Cardinal Hayes pledged to the program. “I picked St. Joe’s because I created a relationship with the head coach [Phil Martelli],” the 6-foot, 170-pound Newkirk told SNY.tv. Newkirk, Class of 2014, said he also considered Towson, Iona, Iowa State and Providence. He averaged 17 points and 8 assists last team en route to All-City honors. NBC Sports: On Tuesday it was announced that 6-4 shooting guard Donte Clark was denied admission to Virginia Tech, leaving head coach James Johnson one man short in his quest to account for the graduation of ACC Player of the Year Erick Green.